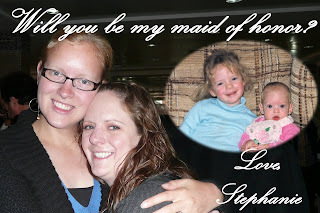 Our Suburban Farm: Will you be my Maid of Honor? So a few weeks ago, when I posted this about asking my bridesmaids, I said that I would post separately abut asking my sister. It has taken me a while because I was waiting for a picture of her opening her package. Her friend was visiting her in Morocco so she has been a bit busy...but she finally sent me the picture! I wanted Erin to get her package and be asked before anyone else....however...as I said in my other post, I did ask Meg first because she was in town. Erin did make me a little crazy because I sent her package and waited on pins and needles for her to get it. Then one day I got a Facebook comment from her saying she got my package but didn't open it yet. !?!?!?!? But then she did the next day! So I got to talk to her on her birthday about it, so that was nice. I also sent her a poem that I found on the lovely Internet (no, I am not this creative), but I tweaked it a little to fit what I wanted it to say. As my sister you must know your place inside my heart. you'll play a special part. It means so very much to me to have you by my side. how close we have come to be. because I'll become a wife. You'll always hold a special place of honor in my life. that's tested, tried and true. Erin should be coming home at the end of May, finished with the Peace Corps! She will arrive home just in time to get her dress fitted and work on last minute wedding stuff. Again, you are making me all teary! This is so sweet!